The American Printing House for the Blind (APH) has an audacious collection of books called “On the Way to Literacy”. “On the Way” is a brilliant ensemble of books for young children that include: Giggly-Wiggly Snickety-Snick, Jellybean Jungle, Thinamajig, The Gumdrop Tree, Something Special, That’s Not My Bear and Geraldine’s Blanket and many other entertaining stories. The storybooks are equipped with large print, Braille and beautiful high contrast pictures that greatly enhance the development of literacy and comprehension in young children who have a visual impairment. As a teacher for over twenty-eight-years, I have witnessed children who were missing out on comprehension, vocabulary and the story background simply because they could not see the visual hints that assist young children in understanding the story’s meaning. I will never forget sitting with my adorable kindergarten student during circle time while the teacher was reading a story about colors. My student, Yasmine, was completely blind and English was her second language, so the question was a very good one. While the other children were looking at pictures of the colors my student was left wondering what the book was talking about. Yasmine taught me that colors can and should be taught along with other experiences in life. A child without vision needs to be taught colors and other concrete skills discovered through books and real experiences, so that they may participate in life with a strong understanding of their world and the people in it. I finally began to understand that my students without vision would need hands-on and a concrete understanding of words and experiences in life. I began to ask the kindergarten teacher that school year for a list of books that she would be reading to her class, and then I created story boxes for my student. Nothing helped Yasmine more with comprehension and vocabulary than actually being able to feel the real objects mentioned in the story. The next time the color book was read, Yasmine smelled scented markers and tasted foods that represented the colors, she loved it. Colors were making sense to her now. She even commented to me one day that brown was her favorite color because she loved Snickers candy. The “On the Way to Literacy” books from APH help to build meaning. When Geraldine loses her blanket in one story, children can ‘feel’ the blanket and touch how the blanket’s texture changes after many days of being loved by Geraldine. When I introduced Roly-Poly Man to Yasmine, she was thrilled. She listened as the child in the story created a ‘roly-poly’ play-doh figure. Yasmine was even more thrilled when she and I created our own Roly-Poly Man from peanut butter play-doh. (You simply mix peanut butter with a white cake mix and make the consistency the same as bread dough). The Gumdrop Tree comes with scented stickers and drawings that show the tree’s growth. I was able to teach shapes, colors, and sizes from this high interest book. Some other ideas that will enhance the story is to have the student feel the growth of a bean that has been planted in a wet paper towel, chew pieces of gum while discussing colors, take the already chewed gum and create a gum tree on a sheet of Manila paper. The student will absorb more information from the story when they are actively participating in the details from the book. Jennifer’s Messes is a wonderful story that has thermoforms of familiar objects such as cereal, pretzels and crayons that Jennifer keeps spilling. Another great skill for enhancement would be for children to compare ‘real’ cereal to the tactual cereal in the book. It is important for students who have a visual impairment to understand that the plastic tactual objects are representations for the real objects. Giggly-Wiggly Snickety-Snick comes with real objects and textures. In my opinion, this cute story demonstrates how real objects teach comprehension, vocabulary and that written words have true meaning. Another favorite book offered from APH is Jellybean Jungle. Jellybean Jungle is a charming book that teaches counting from one-to-ten, rhyming words and color concepts. Another student, that I had a few years ago learned many of his colors from jellybeans, fruit, and Skittles and adored Jellybean Jungle. Before a parent, educator or anyone else reads a book to a child with a visual impairment it is crucial for them to hand the little one ‘real objects’ from the story. The child will feel, smell, touch and taste the story and so it becomes real. I use all of the senses when teaching my students about a story, so that the background is already built. 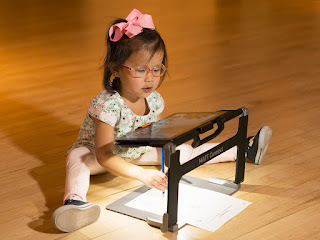 I can then do hand-over-hand tracking of the story with my student who will begin to make the connection that letters create words, words make sentences, sentences make a paragraph and a paragraph develops a well-told story. When families and educators verbalize pictures from a story and inundate the child with real objects and understanding before the book is read, we will begin to produce students who have a strong understanding of literature and who are not behind their sighted peers academically. In Mesquite ISD the vision department does numerous hands-on strategies and have witnessed many student successes throughout the years such as: a radio researcher, a 4.0 college graduate, athletes, students who participate in the gifted program, and a school weatherman. Children who understand their world through experiences either personally or by reading will be successful and great contributors of society. Nothing explains the outcome of good readers more than Dr. Seuss. "The more that you read, the more things you will know. The more you learn, the more places you'll go." — Dr. Seuss, "I Can Read With My Eyes Shut!" Because of great reading materials from APH, our students who have a visual impairment are doing just that.